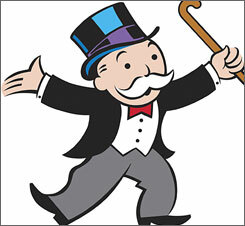 Why the Writers Guild strike may threaten digital rights on-line (or “Defending Mr. Moneybags”). The Explosively Talented Christopher Bird is a great blogger. He not only writes regularly for the Torontoist, but his personal site Mightygodking.com updates regularly, is witty and charming, and covers (almost to a precision decimal place) topics of vital importance to me including Ontario Electoral Reform, lazy writing clichÃ©s, and the Legion of Superheroes. I agree, to an uncanny extent, with most of his viewpoints. Finding a kindred-spirit who is a regular blogger is always truly heartwarming as it makes one feel less lousy about not writing more oneselfâ€¦ I just need to point people in his general direction â€“ takes a lot less effort. Succinct. Great copy. But just not true. I happen to be a media producer. And just like all actors are not Leonardo DiCaprio, and all writers are not Zak Penn, and all directors are not McG (insert a quiet moment of thanks here) – all film and television producers are not the Hollywood studios or the television networks. The majority of independent producers scrape out a living far from opulent (youâ€™d be surprised at the number who lose money each year to be working in the field they do) â€“ and for many of these producers (like myself) any encumbrance on new media rights (like royalties of *any* sort) would likely be a disaster that could shut most of us out of the business. Not only that, but internet savvy viewers and consumers of media (me, again) should have very real concerns that WGA royalties could stifle technological innovation, and limit the choice of content on your television sets, movie screens, or intertrons. â€œBut Bradâ€ you say, â€œyou live up in Soviet Canuckistan, replete with snow, hockey, and powerful currency. Why do you even care?â€ Well, for starters it just reality that almost all global creative labour unions (actors, technicians, writers) take their lead from their US counterparts, so no doubt this strike (and the issues behind it) will reverberate with every collective agreement that comes due in the foreseeable future. Plus, as a consumer, lots of the content I enjoy watching is (or will be) generated by WGA writers under WGA agreements â€“ so any resolution here and now will affect how Iâ€™ll be able to consume this real (or hypothetical) content for the foreseeable future. So I have â€œstakesâ€ as we say in the biz. Raised stakes. Like many (most) people who arenâ€™t members of one of the two bargaining units involved, I am guessing, but it’s an educated guess, that the only real issue behind the strike is figuring out new media royalties. The issue of what a â€œfairâ€ DVD royalty is a sticky issue, but hardly a deal breaker (and Iâ€™ve got some contrarian opinions on this point as well, but let’s save that for a future rant). The availability of new media use (for internet streaming or download) is increasingly a requirement by exhibitors (television networks or film distributors for example) for them to consider purchasing a production. In fact I know of at least one national Canadian network who went through a period where they would not buy any product ( series, special, or documentary) unless they got all new media right (streaming, download, cell phoneâ€¦) with it. As an end user, this isnâ€™t necessarily a bad thing for me. I may not like how the networks implement these rights, but the idea of being able to catch up on series on-line if I miss an episode (or download clips on my cell phone, or ipod, or whatever the network is doing) are exciting. Practically this is what I do personally anyways, as in lieu of a VCR or PVR Iâ€™ll often use bittorrent to catch up on shows if I miss a week or two or am in a location I canâ€™t get network television. These are good uses of new media that promote the health of a show as they are helping the show build (or maintain) an audience, and that is the only currency that matters in the world of television (well, the demographic of the audience is actually more important than the total audience, but you get the gist). However, if a network (or distributor) demands the availability of new media streaming rights to carry your show, they are not necessarily going to pay you more for those rights (since they themselves donâ€™t necessarily have a revenue stream for these usages unless the end viewer is paying anything â€œper useâ€ ). I’d think lots of folks would agree with me in that it’d be preferable to the show if the end user doesnâ€™t have to pay any kind of fees to access that material anywayâ€¦ but Iâ€™m a big Open Source commie, so what do I know? So in our case above, if a production is now required to pay mandatory â€œper viewer royaltiesâ€ a producer would either have to demand more money from their broadcaster to cover what fees might be required (and shows would be essentially penalized for unexpected on-line successes), or make sure thereâ€™s some mechanism involved in any exercising of the rights by which theyâ€™re paid an amount-per-viewing that is higher than any royalties they need to pay out. The end result of either option isnâ€™t desirable â€“ On one hand it would makes it less likely that the show would be purchased by a broadcaster (or at the least, make the show less desirable than competing non-union shows) or, on the other hand, shut down any service which would allow end users to view content without having to pay a â€œper viewingâ€ fee. Itâ€™s also a pretty dark road for end users once you start down this path. How exactly do you determine how many times a production has been â€œviewedâ€ (per person, per IP, per byte transmitted)? Who tracks this and reports it? What kind of security controls do you have to put on legal viewing to ensure accurate reporting? Most troubling, as the boundaries between television and the internet merge, how do you determine what is a â€œnew mediaâ€ usage and what is a â€œtelevisionâ€ usage? Is watching a show over a Slingbox new media or television? What about IPTV? What about people who torrent episodes on-line? Should the producer be liable for royalties for that, unless they sue the transgressors to recover costs? Is the only solution for producers to make sure their shows are never available in any way on-line (or could be perceived to be on-line) or in any format that isnâ€™t crippled with digital-rights-management proprietary gak? Awesome. Thatâ€™s the digital future I, as a consumer, desperately want to avoid at all costs. The core of these (and most labour) issues is about determination of what is â€œfair compensationâ€. Personally, I donâ€™t want to â€œexploitâ€ anyone, or get rich off the hard work of talented artists who have worked long and hard to hone their craft, but I donâ€™t understand why â€œroyaltiesâ€ are a requisite to â€œfair compensationâ€. If WGA members believe they are not being paid fairly then address that in script minimums or purchase price guarantees, or show performance bonuses tied to audience or net revenue, or advertising dollars (Iâ€™d also take a moment to point out most of the examples put forward lately of writers being grossly exploited by producers have been from non-union showsâ€¦ a completely separate matter about labour law and union busting in the US). In all kinds of creative businesses you come up with a fair price to be paid outright for a creative work. In some cases you add in performance bonuses, or gross revenue sharing, in others not. But donâ€™t encumber an entire *technology* thinking somehow youâ€™re redressing perceived injustices from the 80s. Iâ€™d much rather pay a fair price outright for a script and maintain unencumbered rights to distribute and exhibit it however I can. That may mean giving away some (or all) of it for free to build audience to make it more appealing to broadcasters. That may mean tightly controlling it. That may mean allowing unlimited free internet distribution. It may not. Maintaining that flexibility throughout the exhibition chain is the last advantage that independents, and people trying to get new creative types of product in front of eyeballs (regardless of screen size) have to cling to. Without those options to innovate weâ€™ll eventually be restricted to one model of distribution, or only working non-union. If, as a writer, you donâ€™t think Iâ€™m trustworthy to make a fair deal with you and safeguard the best interest of a project – donâ€™t sell me your script (or lease me your limited time to write for me). Yes, there are still some of the cigar chomping, gold chain wearing, lunch-doing, shady producers out there who will squeeze every last cent out of you just for funâ€¦ but a single phone call (or an informed agent) will let you know whose those minority are. For the most part weâ€™re people passionate about storytelling who want to make entertaining products. Plus from a strictly personal interest viewpoint, there’s always more value in maintaining good relationships with the creative partners you work with than burning bridges. To paint these difficult issues with the broad brush of â€œHollywood vs. the common manâ€ is just short sighted, as the interests of the â€œcommon manâ€ also encompass the independent producers, and the end viewers, whose interest in the matter is somewhat glossed over. At a very base level any WGA royalty on new media will directly hamper any type of internet video delivery for WGA signatory product which doesnâ€™t involve a â€œpay per viewâ€ model. I have no trouble with the masses rallying to help the WGA receive fair compensation for their valuable work. Nor does it surprise me that the Writers position is better represented on-line (they are some of the most talented writers in the world, after all…). But it is critical to me that end users recognize that â€œfair compensationâ€ does not have to be synonymous with â€œroyaltiesâ€ and this issue has deep consequences with both those of us who want to make content in the future, and all of us who consume it. Note, of course, that if the viewer has to watch paid advertising in order to see something at no cost to them, it’s not really being given away for free. The only point at which this turns into a “number of times viewed” argument is when the pay per viewing becomes muddied by things like subscription models. E.g., if people could pay $50 a month for unlimited itunes downloads, how do we track the royalties owed. The product was sold, but not on anything like a per-unit basis. Unless I’m mistaken about the WGA (and I believe it’s similar to the WGC agereement which I know well) Writers don’t get royalties on “television” or “film”, just on DVD or Video direct sales. Try to imagine how Televison would work with a “per viewer” royalty and then think about how new media and traditional medias are starting to converge and you get some sense of what I’m worried about. Actually, under the WGA, writers do get a royalty for television reruns — at a far better rate than they currently get for DVD and video sales. As traditional television declines, an essential portion of their livelihood is disappearing without similar compensation from the media which are replacing it. You should read some of the links on this in MGK’s blog. This post from John Rogers is great place to start. Sorry, I wasn’t really clear in my response. I wasn’t saying their aren’t residuals for all television – I was talking about a royalty for first-run television or theatrical distribtuion dependant on views. Let me re-phrase. IMHO “Television” and “New Media” are becoming increasingly unseperable. Especially as IPTV and fibre-optic to home connections increase there’s going to be ever less distinction between the two. To put a per-viewer royalty on once (and that is what we’re talking about with new-media, unless the WGA is really characterizing things differently behind closed doors than they are in the news) but not the other changes the dynamic for independant producers. Similarly, I’m not convinced that new media (or even DVD now a days) is an “additional” revenue stream, it’s just reallocated from a time when everyone was watching network television or in cinemas and revenues from those channels were a lot higher. Again though, I’m not arguing against profit sharing with the writers – I’m just arguing for a system that’s based on all net profits, in all media up front. John Rogers points out that’s tricky because of the accounting that distributors involve – but that’s an issue that affects producers as much as writers (if not moreso).